Public health agencies across Colorado have come together to create the Public Health Radon Aware Colorado initiative to reduce exposure to radioactive radon gas and the associated risk of lung cancer. In Colorado, 50% of homes have unhealthy radon levels; that’s equivalent to every person in the residence having 200 chest x-rays every year. This compare with only 6% of homes having unhealthy radon levels across the rest of the country. Radon is the leading cause of lung cancer deaths among nonsmokers in the U.S. and claims the lives of about 21,000 Americans each year. This is more people than breast, prostate, colon, liver, kidney, and melanoma cancers combined! Radon exposure causes as many as 500 lung cancer deaths every year in Colorado. Real Estate Professionals: Become a Radon Aware Real Estate Professional. It’s quick and easy, and can help save lives. Builders: Use radon-resistant construction techniques (RRNC). Building Departments: Learn about radon-resistant new construction and radon mitigation in this technical guidance for Colorado. 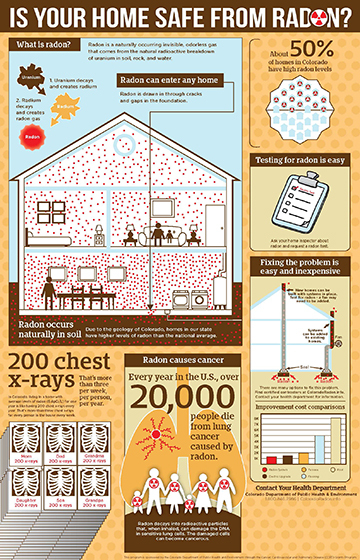 Homeowners: Test your home for radon. Fixing the problem is easy and inexpensive. Rental Property Owners: Test your rental for radon. Inform renters, in writing, before a lease is signed that the rental space has been tested for radon and disclose the results. The Public Health Radon Reduction Roadmap (PHR3) project is funded by the Colorado Department of Public Health and Environment (CDPHE) Cancer, Cardiovascular and Pulmonary Disease (CCPD) Grants program and aims to reduce radon exposure and its associated risk of lung cancer by encouraging and supporting Colorado communities in becoming Radon Aware. The project promotes radon awareness among the Colorado real estate community, policy makers, and building industry professionals of the risks of radon and the best techniques to reduce exposure.